RUSH: Trump has doubled down on his criticism of the Freedom Caucus. Now he’s calling them out by name: Mark Meadows and a couple others. This is not good, folks. Not good. After a football team loses a game, what does the head coach do in the post-game press conference? RUSH: So President Trump doubling down here on his criticism of the conservatives in the House, the Freedom Caucus. The Politico headline: “Trump Goes After Freedom Caucus Ringleaders.” Now, what kind of a group has ringleaders? Gangs, right? Criminals, bank robbers, drug networks. The ringleaders of the group are usually criminals. I mean that’s the inference people draw. So here’s The Politico: “Trump Goes After Freedom Caucus Ringleaders.” Mark Meadows, Jim Jordan, Raul Labrador. Says here that Trump’s offensive could hurt them in their home districts where he is extremely popular. “‘If @RepMarkMeadows, @Jim_Jordan and @Raul_Labrador would get on board we would have both great healthcare and massive tax cuts & reform,’ Trump tweeted Thursday afternoon.” And we have the New York Times, or is it the Washington Post? It’s the New York Times. “How the Freedom Caucus Is Undermining the GOP.” Yeah, you see? It’s always the conservatives that are doing the “undermining.” It’s the conservatives that have “ringleaders.” It’s Trump calling them out. I want to take you to your average Sunday or Monday night in the National Football League. “Anthem Inc. is likely to pull back from Obamacare’s individual insurance markets in a big way for next year, according to a report from analysts who said they met with the company, a move that could limit coverage options for consumers at a politically crucial time for” Obamacare. Now, I thought… Forgive me, my friends, for listening to the Drive-By Media, but I thought Obamacare was not in trouble. I mean, somebody said that Obamacare’s in “a death spiral,” and some news network fact-checked him. Who was that? Who said Obamacare’s in a death spiral? It might have been one of the Freedom Caucus people. Anyway, the Drive-Bys are out there defending Obama. “It’s not nearly as bad a shape. It’s not crumbling like the Republicans say. It’s not in a death spiral.” They did. They fact checked somebody. And yet here is another major insurance company saying we gotta pull out of this, and we’re pulling out of this next year. We can’t survive. I thought the Democrats have been assuring us it was just Republicans and probably Russian propaganda that the Obamacare law was unraveling, that it was spiraling down. After all, if Obamacare was really on the rocks, the Democrats would be very eager to fix it, wouldn’t they? Ha-ha-ha-ha. A little sarcasm there. But it does raise the question: Why aren’t Anthem and the rest of the insurance companies pushing the Ryan plan or any of Trump’s reforms? They had no problems pushing Obamacare like crazy. And if the thing is imploding, if they’re gonna be pulling out, why aren’t they gonna be pushing one of these gigantically great reform plans, hmm? I mean, all these insurance companies were in from day one with Obama. And the main reason for that was Obama guaranteed them a profit by demanding every American buy their stupid product. So if you’re in the business and the federal government passes a law saying every citizen has to buy it or pay a penalty and maybe go to jail, you’d love to be in that business. And then, if you set up rules where the insurance companies and states don’t have any competition from outside, you can’t lose, except they all are. In a legal circumstance where the insurance companies were set up not to fail, guess what’s happening? (interruption) Damn right I mean not to fail. Okay. Follow this now one more time. Who wouldn’t sign up with that? Does that not sound like a guaranteed success path? And yet all of these insurance companies slowly but surely are pulling out of it. And, by the same token, I don’t see any of these insurance companies eagerly embracing the Ryan replacement plan. RUSH: Now, to this health care business. 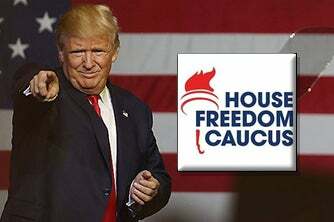 As I mentioned earlier today, the president has doubled down on the Freedom Caucus, the 30 or so members of the conservative members of the House of Representatives, The Politico and such others in their headline are referring to the three Freedom Caucus leaders as the ringleaders, Mark Meadows, Jim Jordan, Raul Labrador. The ringleaders? What do you associate ringleaders with? Ringleaders — crime, gangs. Exactly right. Bank robbers. The ringleaders of the group were hiding in the getaway car parked one block down the street. So now these guys are being characterized as ringleaders of some gang, some out-of-control gang in the House, and Trump has doubled down on it. Look, folks, calling them out like this, I know it’s Trump’s technique; I know it’s Trump’s method. But there’s a better way of doing this. These guys are not the enemy. The Democrats are the enemy. The Freedom Caucus has actually made a pretty big move here. The Washington Examiner has the story: “Freedom Caucus’s Reasonable Demand on Obamacare Repeal — President Trump and most of official Washington blames the House Freedom Caucus for the death of the American Health Care Act,” which is the Trump version of the bill. “There is some, but not complete, justification for this. 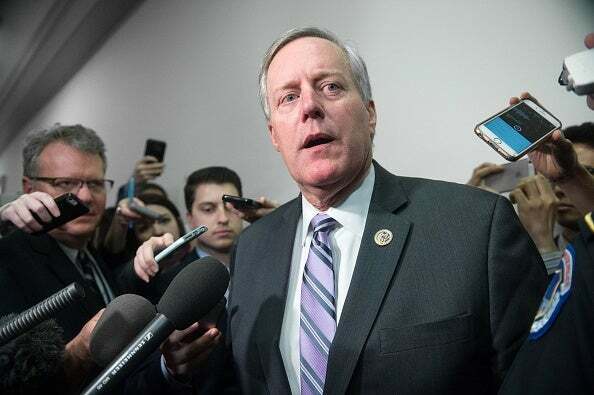 But the Freedom Caucus’s top members have since laid out a clear path to passage or repeal and replace, and are showing a willingness to compromise.” Just in the last couple of days. But it’s clear that the objective here was to get a win. The objective was to really knock it out of the park in the first two months, fulfill a campaign promise, say that Obamacare had been repealed and the replace effort was underway, first phase of three. But the ringleaders of the Conservative Caucus were suspicious that this was not gonna end Obamacare, and they had campaigned promising to do so. “Caucus Chairman Mark Meadows laid out his conditions in an editorial board meeting at the Washington Examiner Thursday. The Affordable Health Care Act repealed the employer mandate and the individual mandate. That’s two of Obamacare’s 12 mandates.” There are 12 Obamacare mandates, and two of them are that the employer must provide coverage and that the individual must buy it from somewhere. The Freedom Caucus has asked for two more to be included in the repeal. Mark Meadows said, “If you could just add two more, it would bring us to a total of four of the 12 Obamacare mandates, and that is our ask.” Get rid of these four Obamacare mandates in exchange for our “yes” votes. Here are the additional two mandates that Meadows cited. And these are big. The essential health benefits — that’s the stuff that Obama added after the bill was passed at the discretion of the secretary, who happened to be Kathleen Sebelius. She could just make it up. The bill empowers the secretary of Health and Human Services to make up whatever benefits she wants to throw in there. And by virtue of her desire, they become part of the law. Those are the things that in phase 2 our secretary, Tom Price, was gonna pull out of there. What Mark Meadows is saying, get rid of those things by statute. Name them and get rid of them and pull ’em out so that the next bunch can’t come in and just automatically put ’em back in unless they go through the process of passing a new law. It’s not unreasonable at all, because these were not part of what was voted on anyway. These were added after everybody voted, and they were Obama oriented left-wing premises, so-called health benefits. I can’t give you the names of any right off the top of my head, but it was whatever Kathleen Sebelius wanted. This was where she could mandate that the Catholic Church buy everybody a condom, buy everybody birth control pills. They didn’t dare put that in the legislation. Things like that. The second thing — remember, there are 12 Obama mandates. The fourth mandate, well, actually the second because the employer and the individual mandate are already gone in the Trump-Ryan bill. The second of the new mandates to come out is called community ratings. Now, community ratings, I’m not gonna have time to get into what they are here before the break, but the point is the Freedom Caucus is moving. They’re not demanding a full repeal now in order to get on board. They have identified an additional two Obamacare mandates which are at the top of the list of the worst. And if those would be pulled out, they could see themselves changing and voting for the bill, which would then put the pressure on the Republican moderates who really are the ones that brought this bill down. Because when they saw that it wasn’t gonna pass, they peeled off left and right. They didn’t want their names attached to it in any way if it was gonna be defeated. So their hearts weren’t in it in the first place. They were just sitting around watching, the Republican moderates were, and taking the temperature of the wind and getting in the direction they needed to be in for least damage. But Meadows says if you get rid of the essential health benefits, these things the secretary adds at whim and community ratings, then you’ve got us. This is this kind of stuff that makes you buy hemorrhoid insurance when you’re 18 years old, that kind of thing. It makes you buy things you’re never gonna have because you’re too young. It removes such restrictions. These are mandated on the insurance companies to sell. They had no choice, and you had to buy it if you wanted coverage. The Essential Health Benefits require coverage for ambulance rides, mandated coverage for ambulance rides. “‘Community Rating’ is the name for Obamacare’s price controls on premiums. An insurer can’t raise premiums on risky individuals without also raising premiums on less risky individuals. The result is that everyone’s premiums go up.” Because, by definition, a risky individual’s premiums are gonna be high. That’s the insurance business. But Obama Community Ratings — the way they title these things, Community Ratings, how can you be against that? It’s for the community. What these essentially did is mandate that whatever premium prices were put in place to cover the risky, the same increases had to be in premiums for those who were not risky, were healthy. And so the premiums for healthy people continued to skyrocket because they were not being treated any differently than those at high risk. It was absurd. So the Freedom Caucus says get rid of these two things and we’re on board, because we’ll get rid of the ridiculous mandates and the penalties that go along with it, and we will lower premiums. And that’s what this is all about when you get down to brass tacks. That’s where we are. There are 12 mandates in Obamacare. The Trump-Ryan version only got rid of two of them. Both of them are mandates: The employer mandate, the individual mandate. So “the ringleaders” of the Freedom Caucus say (summarized), “Okay, give us two more mandates. Get rid of these essential health benefits and get rid of the community rating crap,” which has caused premiums to skyrocket, “and we could probably vote for a new version.” So we’ll see. We’ll see. But on the surface… I mean, because Mark Meadows went to the Washington Examiner to lay this all out yesterday, and Trump began to unload on ’em on Wednesday, and maybe earlier than that. Trump’s unloaded on ’em twice. He unloaded on ’em generically, and then he named names the second time. RUSH: We’re gonna go to Durango, Colorado. This is Bill, and it’s great to have you on Open Line Friday. Thank you for calling, sir. CALLER: Thank you, and flyover country dittos to you, Rush. CALLER: Just a quick thought then I’ll get off of here. You know, Trump needs to not ask for that which he doesn’t want. And you’re liable to get it. Remembering George Bush, and he whipped the Republicans to vote for a very unpopular program called Medicare Part D, and it ended up costing him, the Congress. And he ended up having to deal with Nancy. And the health care bill as now constructed is just as unpopular with Republicans as the Medicare Part D was. RUSH: Yeah, it’s true. That’s true. Happens to be true. CALLER: This jammed through, Nancy’s gonna be running the show again. RUSH: Well, you mean if they do this, that the Democrats might win the House back in ’18? Is that what you think? CALLER: Yes, that’s exactly what I think will happen. RUSH: Well, I don’t think this bill is gonna see the light of day. CALLER: Well, I hope you’re right. RUSH: Now, the bill that was rejected, I don’t think they’re even gonna bring it back up. Now, they could. I mean, they might think they’ve applied enough pressure to the ringleaders of the Conservative Caucus and that they’ve intimidated them enough to vote for it, but I don’t think so. I think the bill went down the tubes and it’s not gonna be brought up unless there’s some changes made to it. Remember, it wasn’t just the conservatives peeling off of this thing. I mean, this isn’t reported. There were a lot more RINOs and moderates running for the hills on this than there were in the Freedom Caucus. They just tried to put the onus on the Freedom Caucus here because they’re the conservatives, and they’re the convenient whipping boys and girls. Whipping people. But the moderates in the House, when they saw that it wasn’t gonna pass, they didn’t want to hang around at all, they didn’t want to expend one ounce of effort to save it. All they wanted to do was get their names off of it. There were, I think in truth, there were far more Republicans that were in their hearts opposed to this thing and didn’t want to support it, but they were driven by the salesmanship of solidarity and giving the president his first legislative victory right out of the box, big deal. I told everybody that day — well, Friday afternoon. I was not here, the program was over. I played golf the next day, I was telling everybody, “Look, at least the opportunity to make this better is present. There’s the possibility of good coming out of this.” And I think that’s true. And I’ll be shocked if they try to revive the same bill after thinking they have twisted arms a little more to get some people to support it. I don’t think that will happen.